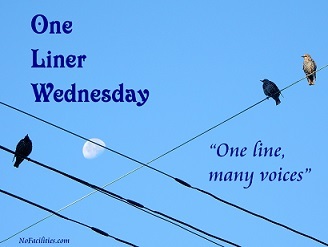 Categories: Blogging, Blogs, One-Liner Wednesday, Photograph, Prompt | Tags: #1linerWeds, Canada, inspiration, Instagram, Ontario, photography, WordPress, writing prompt | Permalink. Pingback: One-Liner Wednesday: Love the Questions | Anything is Possible! I haven’t figured out Instagram yet probably because I have to use my phone to use it, or so I think. As far as lame posts go, mine this week is pretty lame. I’m still trying to get that perfect deep thought written down. Haha! Aren’t we all? 😉 And yes, you have to use your phone for Instagram – precisely why it took me so long to get into it. My old phone just couldn’t handle being online to that extent. I’ve haven’t been able to load photos on instagram. It wants some kind of password I don’t remember, then itunes gets involved…. It’s nice to know I’m not alone. Maybe I’ll try again some day. That’s s beautiful photo, Linda. I’m not on Instagram but if I join, I’ll connect. Absolutely gorgeous photo Linda! I’m now following you on Instagram! Gorgeous photo Linda. I will find you on Instagram but I don’t post that much as I keep forgetting about it ! Oh I love Instagram! Followed!